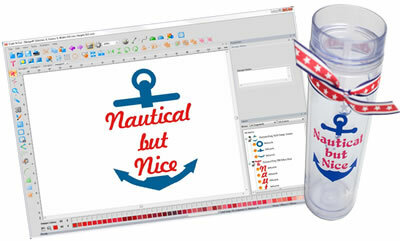 The Perfect Software Match for your Fabric & Vinyl Cutting Machines! Software comes with Educational training videos by Hope Yoder and over 200 of her Exclusive Designs! The select software to take you directly from the box to crafting your own special designs with the fabric & vinyl cutting machine you already own! In addition to its suite of editing tools for artwork & appliqué, ONLY Craft N Cut™ has the feature Save 2 Cut, which calculates the settings your machine needs for your chosen design and material! Cut out the guesswork and unleash your creative possibilities! FULL-FEATURED ARTWORK Tools for creating designs! VECTOR ARTWORK EDITING Tools to modify designs! EMBROIDERY APPLIQUÉ TOOL for creating appliqué stitches! EMBROIDERY RUN STITCH TOOL to create run stitches! SAVE ARTWORK TO EXPORT TO CUTTER machines! WORD PLAY TOOL to fill shapes with words!